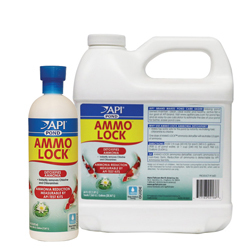 API Pond Ammo Lock detoxifies poisonous ammonia, which is continually produced in your pond by waste, to a safe form for fish. This product eliminates ammonia stress, and promotes healthy gills and a safe pond environment for your pond fish. One dose of ammo lock will neutralize 7.0ppm of chlorine, 3.0ppm of chloramines, and detoxify 3.0ppm of ammonia.